Howard Thomas King, 89 years, of Lanigan passed away peacefully at Lanigan Hospital on Friday, February 1, 2019. Howard was born on March 19, 1929 at Moose Jaw to David and Bertha (nee Parke) King. He attended Tugaske School, northwest of Moose Jaw up until Grade 11. He worked for CPR at Bridgeford for 2 years and then moved to Quill Lake, where he worked for the Department of Highways for the next 15 years. While at a dance in Watson, Howard met Wilma Lowe. They were married in Watson on September 2, 1957. They were blessed with a family of four, two sons and two daughters. In 1965, they moved to Lanigan where Howard began work at the Alwinsal Potash Mine. He worked underground for three years and then worked as a safety supervisor and mine rescue trainer. Howard retired from the mine in 1987. Never one to sit still, he started a landscaping business called King’s Landscaping which he operated for a couple of years. At one time, he was rototilling 100 gardens each year. He continued to do rototilling up until 2016. Howard played hockey as a goalie when he was younger. 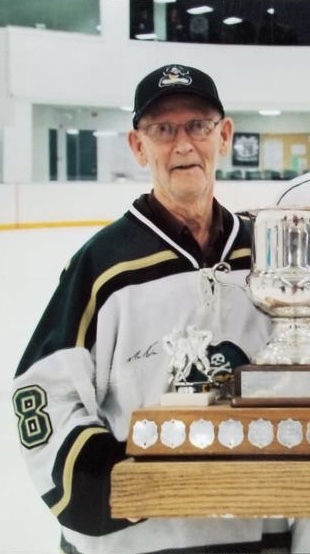 His love of hockey continued through the years and he was an avid fan of the Lanigan Pirates for 50 years. Howard and Wilma’s dog Izzy, is their baby and an important part of their family in recent years. Howard will be lovingly remembered by his wife Wilma King of Lanigan; their four children, 11 grandchildren and 18 great grandchildren: GORDON King of Hafford and family David (Meghan) King and children Hudson and Mitchell of Saskatoon, and Amy (Bryant) Hayden and children Ellis, Sonny, Munroe and Riel of Saskatoon; BRUCE (Dianne) King of Pincher Creek, AB and family Tiana (Lex) Navarro of Calgary and Tyler King and his son Ethan of Pincher Creek; KATHY (Randy) Makinson of Lanigan and family Drew (Kaila) King and children Owen, Kali, and Levi of Delisle, Morgan Planchot of Moose Jaw, Kelly Makinson (Tim) and children River and Hunter of Red Deer, AB and Scotty (Nicole) Makinson and daughter Sophie of Winnipeg, MB; and SUZANNE (Mark) Nivon of Lanigan and family Catlin (Kara) Nivon and children Griffin and Lydia of Moose Jaw, Allysa Nivon (Tim) and children Pierce, Orrin and Axton of Grande Coulee, SK, and Dane Nivon of Lanigan. Howard was predeceased by his parents David and Bertha King; sister Mildred and brothers Harry, Cecile, Jack and Gordon. A Celebration of Life for Howard was held on Saturday, February 9, 2019 at 1:00 p.m. at the Lanigan Community Hall officiated by Pastor John Dueck. Memorial Donations in Howard’s memory may be made to Lanigan Hospital.